Hundreds gather with a message of unity for President Reuven Rivlin who received threats after denouncing Jewish extremists. Hundreds of Israeli citizens on Friday afternoon gathered for a Kabalat Shabbat (the service said on Sabbath eve) outside the President's Residence with a message of unity for President Reuven Rivlin. The unity rally was meant to express support for Rivlin, who has come under fire in recent days after he denounced “Jewish terrorism” in the wake of the arson attack in the Palestinian Authority village of Duma, which has been blamed on Jewish extremists. 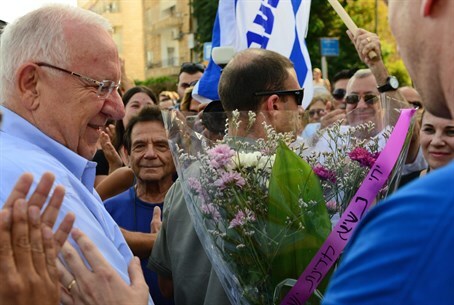 Rivlin came out to meet the hundreds of Israelis who gathered outside his home, thanking them for their encouraging message and for organizing such a gathering particularly at that time. “I am excited and moved by this meeting. I know how united we are as a people. We are united at demanding times, times of crisis and danger, and at other testing times. All of us, citizens of this state, are equal to one another, and that is how we want to live, as equals among equals. This meeting is greatly heart-warming, it is a meeting of 'brethren dwelling together, thank you all," he continued. Earlier this week, Rivlin turned to the Israel Police over a number of death threats he received on his Facebook page, after he wrote a post condemning the Duma arson attack. Several took ire with Rivlin's post, with retorts ranging from simple name-calling to violence. "I pray that there will rise another Yigal Amir, Shlita, who will clean the state from you and from Arabs - I wish you terrible diseases and every evil," one poster threatened, referring to the man who shot and killed Prime Minister Yitzhak Rabin in 1995. Other posters were less malignant in their criticism, but did note that they do not see Rivlin as representing them, and - in one case - had removed his photo from their home and advised their children not to emulate the President. Speaking several days later at an evening in memory of senior police officer Ephraim Bracha, Rivlin called on those who write the insulting posts on Facebook to think before they do so. "Just before sending out the sharp article, sharing the virulent post, before the shaming and lynching on the internet - stop for a moment, on the other side there is a human being," he said.